Why Work in the Electronics Manufacturing Industry? A question that job seekers should always ask of potential employers is, “Why should I work in your industry?” It is an important question when you consider that only 60 of the original Fortune 500 companies from 1955 are still in existence in 2017. Changing customer tastes, mergers, technology and many other reasons are responsible for this, but it does give us at least one key takeaway: the company I start my career with probably won’t be the one I end it with. As a result, it is important to ensure the industry you go into will be able to stand the test of time. 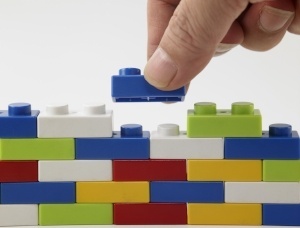 When one enters an industry, be it as an engineer or an accountant, you begin to build specialized knowledge of that industry within your field. This provides you with a competitive advantage in the job market of that industry. Companies are willing to pay more for an engineer with experience in their industry than one they will have to train. If you suddenly find the industry you are in obsolete, all of your specialized knowledge becomes likewise obsolete. For example, someone who was an engineer in the cathode ray tube industry may not find themselves as competitive for the top jobs anymore. The electronics manufacturing industry is an exciting place to be, and there is no immediate replacement or end in sight. When you join a company like Cimetrix you have the opportunity to develop and support the software that runs manufacturing equipment in factories worldwide. Those factories create computer memory and processor chips, RF and microwave transmitters, sensors and actuators of all shapes and sizes, power devices and amplifiers, display drivers, and many more items that go into the electronics we use every day. You are also part of an industry that meets the demands of many different and diverse end users, providing some shelter from the ups and downs of any particular market. When cell phones became less popular in favor of smart phones, the demand for new products didn’t go away—it simply changed the type of products were called for. One specific benefit of life at Cimetrix is that we are an integral part of the the electronics manufacturing and related industriesy. We often refer to one another as family, we take care of each other, celebrate our successes and create an environment where people enjoy coming to work. 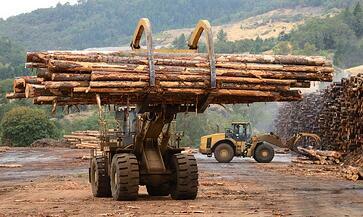 We have very competitive benefits and compensation, so we can pay you what you are worth. Many employees even have the option of working from home up to three days a week, saving them wear and tear on their vehicles (and their nerves from driving in traffic!). If you are ready to join an exciting, dynamic, growing and fun industry, please check out our open positions. In the first blog of this series, Clare Liu of Cimetrix China made the compelling case for choosing a commercial software platform for implementing the equipment side of the EDA (Equipment Data Acquisition) standards interface rather than developing the entire solution in-house. Whenever this “make vs. buy” decision is discussed, however, the following question inevitably arises: “If we choose a standard product for this, how can we differentiate the capabilities of our equipment and its data collection capability from our competitors?” It’s a great question which deserves a well-reasoned answer. Most advanced fabs use EDA to feed their on-line FDC (Fault Detection and Classification) applications, which are now considered “mission-critical.” This means if the FDC application is down for any reason, the equipment is considered down as well. It is therefore important to choose a computing platform for the EDA interface that is highly reliable and has enough processing “headroom” to support the high bandwidth requirements of these demanding, on-line production applications. Moreover, this platform should not be shared by other equipment communications, control, or support functions, since these may adversely impact the processing power available for the EDA interface. Surprisingly, this approach is not universally adopted, and has been a source of problems for some suppliers, so it is an area of potential differentiation. The automation requirements for the most advanced fabs call for the latest versions (Freeze II) of all the standards in the EDA suite, including the EDA Common Metadata (E164) standard. Dealing with older versions of the standard in the factory systems creates unnecessary work and complexity for the fab’s automation staff, so it is best to implement the latest versions from the outset. The Cimetrix CIMPortal Plus product makes this a straightforward process using the model development and configuration tools in its SDK (Software Development Kit), so there is absolutely no cost penalty for providing the latest generation of standards in your interface. It takes time and effort for equipment suppliers with older versions of the standards to upgrade their existing implementations, so this, too, is an opportunity for differentiation. This is probably the area with the largest potential for competitive differentiation, because it dictates what a factory customer will ultimately be able to do with the interface. If an equipment component, parameter, event, or exception condition is not represented in the equipment model as implemented in the E120 (Common Equipment Model) and E125 (Equipment Self-Description), and E164 (EDA Common Metadata) standards, the data related to that element cannot be collected. In effect, the metadata model IS the data collection “contract” between the equipment supplier and the fab customer. This is why the most advanced fabs have been far more explicit in their automation purchase specifications with respect to equipment model content, going so far as to specify the level of detailed information they want to collect about process performance, equipment behavior, internal control parameters, setpoints and real-time response of common mechanisms like material handling, vacuum system performance, power generation, consumables usage, and the like. This level of visibility into equipment operation is becoming increasingly important to achieve the required yield and productivity KPIs (Key Performance Indicators) for fab at all technology nodes. The argument about “who owns this level of information about equipment behavior” notwithstanding, providing the detailed information the fabs want in a structure that makes it easy to find and access is a true source of differentiation. If you really want to set your equipment apart from your competitors, consider going well beyond simply providing access to the level of information needed to monitor equipment and process behavior and include “built-in” Data Collection Plans (DCPs) that save your customers the effort of figuring out what data should be collected and analyzed to accomplish this. Your product and reliability engineering teams probably already know what the most prevalent failure mechanisms are and how to catch them before they cause a problem… why not provide this knowledge in a form that makes it easy to deploy? A few visionary suppliers are starting to talk about “self-diagnosing” and “self-healing" equipment… but it will be a small and exclusive group for a while – join them. Before the fab’s automation team can fully integrate a new piece of equipment, it must follow a rigorous acceptance process that includes a comprehensive set of interface tests for standards compliance, performance, and reliability. This process is vital because solid data collection capability is fundamental for rapid process qualification and yield ramp that shorten a new factory’s “time to money.” If you know what acceptance tests and related software tools the fab will use (which is now explicit in the latest EDA purchase specifications), you can purchase the same software tools, perform and document the results of these same tests before shipping the equipment. This will undoubtedly speed up the acceptance process, and your customers will thank you for the effort you took to put yourself in their shoes. Incidentally, this usually means the final invoice for the equipment will be paid sooner, which is always a good thing. In this posting, we have only scratched the surface regarding the sources of competitive differentiation. As you can see, choosing a commercial platform enables this far more readily than the in-house alternative, because it allows your development team to focus on the topics above rather than worrying about compliance to the standards. If you’d like to know more, please give us a call or click below to talk schedule a meeting. IPC Apex Expo is one of the largest gathering of professionals from the printed circuit board and electronics manufacturing industry (EMS). Attendees and exhibitors come from around the world to participate in the expo, the technical conferences and Standards Development meetings. 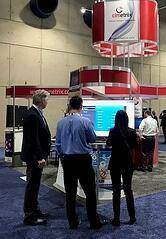 This is the third year in a row that Cimetrix has exhibited at the IPC Apex conference. Cimetrix features the latest in Smart Factory and Equipment Connectivity technology. For the show this year, we chose to upgrade our booth space, allowing us to have more meeting room within the booth as well as several prominent demo stations in each corner. 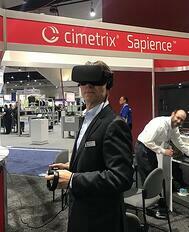 We also featured a popular Virtual Reality station in our booth. We brought a great team of ten to the show this year to staff the booth, give demo’s and greet the many attendees who stopped by throughout the 3 day expo. We chose to participate in the popular Passport to Prizes game for the second year in a row. This sponsorship is a great tool to get the Cimetrix name out in the industry. It also brings in many attendees to our booth for some great conversations about our products and services. We also had to opportunity for the Cimetrix Vice-President and General Manager of Smart Factory Business, Ranjan Chatterjee, to be interviewed by SCOOP TV both one-on-one and as part of a larger panel discussion. You can view Ranjan's one-on-one interview in the Cimetrix Resource Center. To learn more about our products or services, you can schedule a meeting any time. Cimetrix CIM300TM tool kit out of the box has already implemented a lot of the GEM 300 work for you. Notice I said “a lot” and not “all” of the work for you. To complete your GEM 300 application, your software will have to integrate with CIM300. The GEM 300 standards can be quite complex and some of the scenarios have intricate details. CIM300 provides a rich set of APIs and callbacks to help you implement a compliant GEM 300 solution. The key to success is knowing how to use the APIs and callbacks for the different GEM 300 scenarios. The SEMI E87 Carrier Id Status state model, pictured below, is just one of many state models defined in the GEM 300 standards. However, how you specify the parameters to the call, it is different for each scenario. 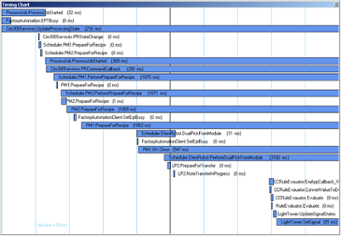 The differences in how you call the API will trigger different transitions in the state model. Our documentation for this one API call alone is longer than this entire blog post. That is how important it is to get it right. 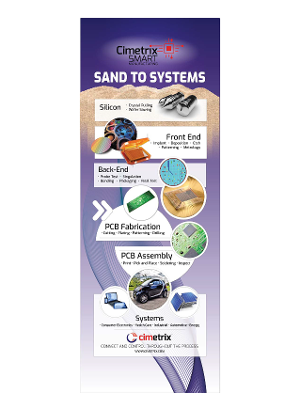 In addition to our product documentation, Cimetrix also provides CIM300 training and sample applications illustrating how to use our products. I strongly recommend taking advantage of our CIM300 training. Training is the best first step to integrating CIM300 with your tool application. Training is typically a week long and provides an overview of the GEM 300 standards as well as hands-on experience using CIM300. The goal for Cimetrix in training is that by the end of the week-long training, clients have completed an implementation of a GEM 300 happy path scenario. That is, you receive hands-on experience using CIM300 to implement carrier verification (SEMI E87), creating and running a process job (SEMI E40) and control job (SEMI E94), tracking substrates (SEMI E90), and tracking equipment performance (SEMI E116). Make sure you also leverage the sample applications that accompany CIM300. The sample applications provided with CIM300 give a jumpstart on integrating CIM300 with your own application. You can use the sample application as a reference for how to use our APIs and callbacks, copy/paste portions of the code into your own code, or use our application as a starting point for your own software. If you’re like me, you like having working source code you can refer to for concrete examples of how to do things and to see how things should work together. If you dive right in and start implementing CIM300 without training or mentoring from an expert, you may find yourself spending a lot of late nights asking yourself, “what have I gotten myself into?” A little training goes a long way in simplifying the implementation! Find out more about CIM300 or request a Technical Product Overview and/or Product Demo today! In a world of automated equipment, having tools to automate the testing of an equipment’s implementation of the SEMI EDA (Equipment Data Acquisition) standards (also known as Interface A) is invaluable. Cimetrix is proud to announce an integrated solution that supports the broadest range of use cases in EDA/Interface A testing - the Cimetrix EDATester™. EDATester is a tool that will help organize, streamline, and automate the testing process while also providing other analytical capabilities. Cimetrix knows that testing an equipment interface is not simply a one-time event; rather, tests should be performed in the OEM’s facilities throughout the development process and before final shipment, upon delivery to the customer’s factory, and even after the equipment has been placed into full production. Cimetrix EDATester is designed to do exactly that. What do we really mean by “testing?” What are we testing? Since the scope is very broad, let's frame the answer in a few distinct categories. EDATester uses ISMI’s functional evaluation procedures as guidelines, and implements tests that are automated for all client-side actions. A process that might have taken multiple days to execute manually can be done in minutes, even when some interaction with the equipment itself is required; the fully automated tests that require no user interaction with the equipment can be run in seconds. Everything might look great on the client side with the ability to define a DCP, activate it, and start receiving data; but how many DCPs will the equipment actually support? How fast can I sample the parameters I want to collect in my Trace Requests without overloading the equipment’s EDA interface? Even if I could do this manually, how would I begin to answer this question? The testing tool in practical use across the industry for measuring an equipment’s conformance to the SEMI E164 EDA Common Metadata standards is called the Metadata Conformance Analyzer (MCA). It uses a set of .xml files describing the metadata model as input, analyzes the model according to the requirements of E164, and provides feedback. 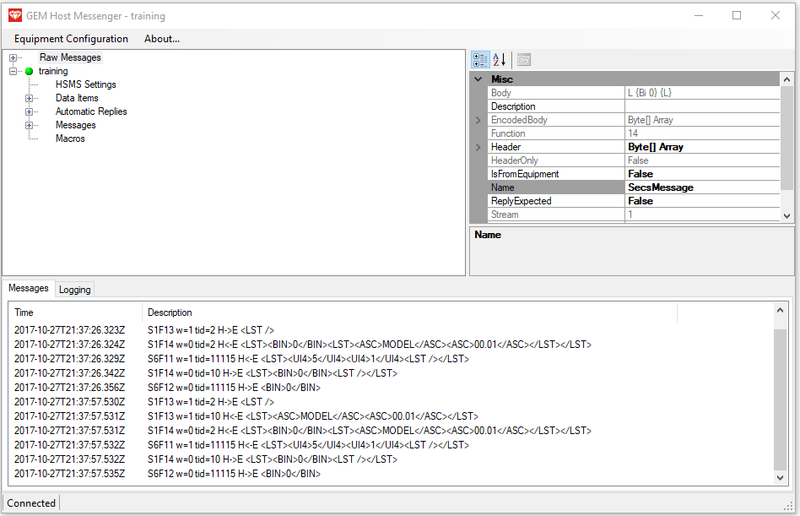 EDATester currently generates the .xml input model files required by the MCA, and may eventually incorporate the model conformance testing functions as well. Having the correctly sized wrench when you need to apply the proper torque to a bolt is helpful and sometimes necessary—at least you can get the job done. But when you have hundreds of bolts to insert and tighten precisely, wouldn’t you rather have an adjustable ratchet? Or an air ratchet? Whether it’s to test and characterize the EDA interface on a new equipment type, verify that a software update to a production piece of equipment has been installed correctly, or debug an interface performance issue that has somehow arisen in production, the Cimetrix EDATester is the right tool to have in your arsenal to quickly, effectively, and thoroughly “test” an equipment’s EDA interface capabilities. Don’t waste another day with manual processes that leave you guessing. Get in touch with us today to find out more about the EDATester product. Generally, when I do a DIY (do-it-yourself) project around the house, I spend the majority of the time searching for my tools. The other day I was helping a friend with a project. He had a well-organized tool box and it seemed that the perfect tool was always at his fingertips. I was amazed at how fast the project went and how easy it was when the right tools were handy. In April of 2016, we published a blog called OEM EDA Implementation Best Practices that outlined ten things to consider when designing an equipment-side EDA / Interface A solution to fit your needs. This blog post analyzes a few of those recommendations and looks at how using the Cimetrix EDA products CIMPortal Plus, ECCE Plus and EDATester (a well-stocked and organized tool box) makes it very easy to follow those recommendations. The blog post mentioned above states, “Since the content of the equipment metadata model is effectively the data collection contract between the equipment supplier and the factory users, your customer’s ultimate satisfaction with the EDA interface depends on the content and structure of this model.” Before building your model, you need to determine what data the equipment will make available for collection. CIMPortal Plus has the concept of a Data Collection Interface Module (DCIM) that publishes this data to the EDA server. The engineer building the model will map the data from the DCIM into the equipment model. Once the mapping of the data is complete, the engineer will need to put this data in a format understood by the server. 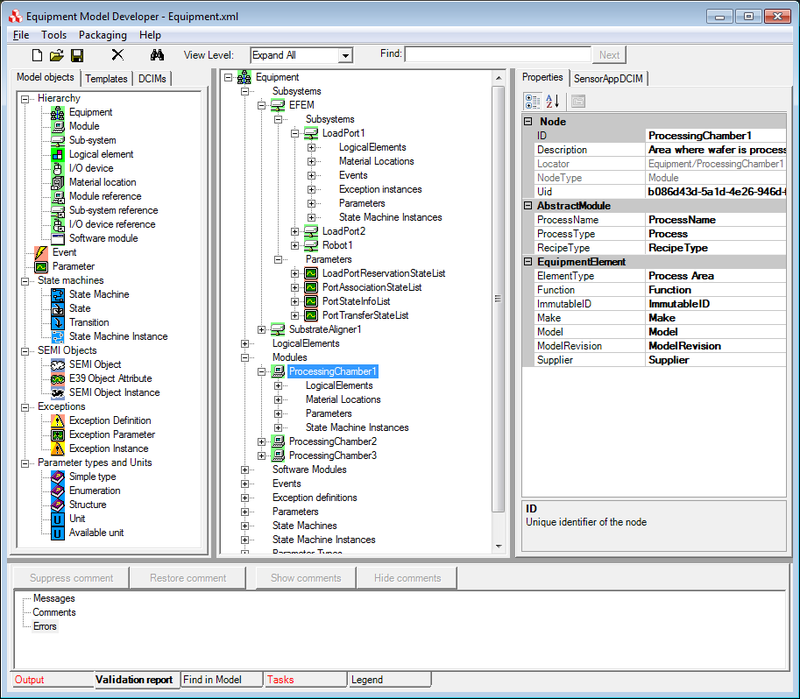 CIMPortal Plus provides a utility called Equipment Model Developer (EMDeveloper – pictured below) that makes it easy to create the hierarchy of your equipment (SEMI E120) and embed the data from the DCIM into that model (SEMI E125). If you use the tools and best practices provided in EMDeveloper, your equipment model will conform to the SEMI E164 (EDA Common Metadata) standard as well. This can be very useful when writing data collection applications so conformance to E164 is being required by more and more fabs. The E164 standard was developed to encourage companies using Interface A connections to provide a more common representation of equipment metadata based upon the SEMI E125 Specification for Equipment Self-Description. This makes data collection more uniform across these pieces of equipment. 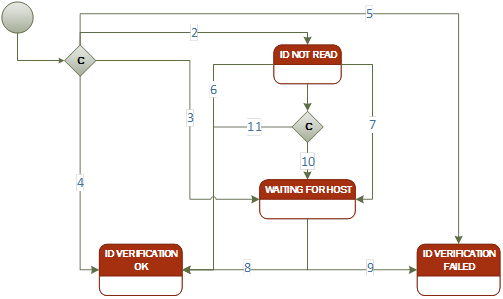 Once the model is created and validated, it is deployed to the CIMPortal Plus server. The server is the component that manages and tracks all data collection plans, reports, tasks, access control and timing. 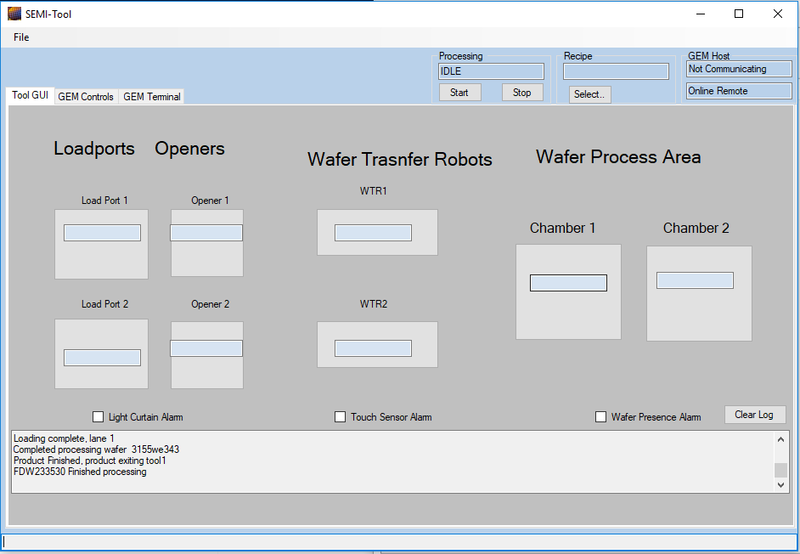 With the DCIM information embedded in the model (described above), it is easy for the equipment control application to push the data to be published to the EDA server for collection. 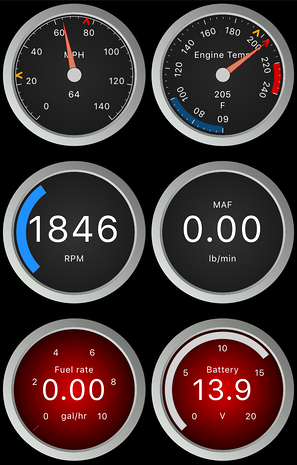 This is done by using a simple API available on the DCIM interface. In addition to CIMPortal Plus server capabilities, Cimetrix has other products available to help with client-side data collection. ECCE Plus is an industry approved method for manually testing EDA implementations. 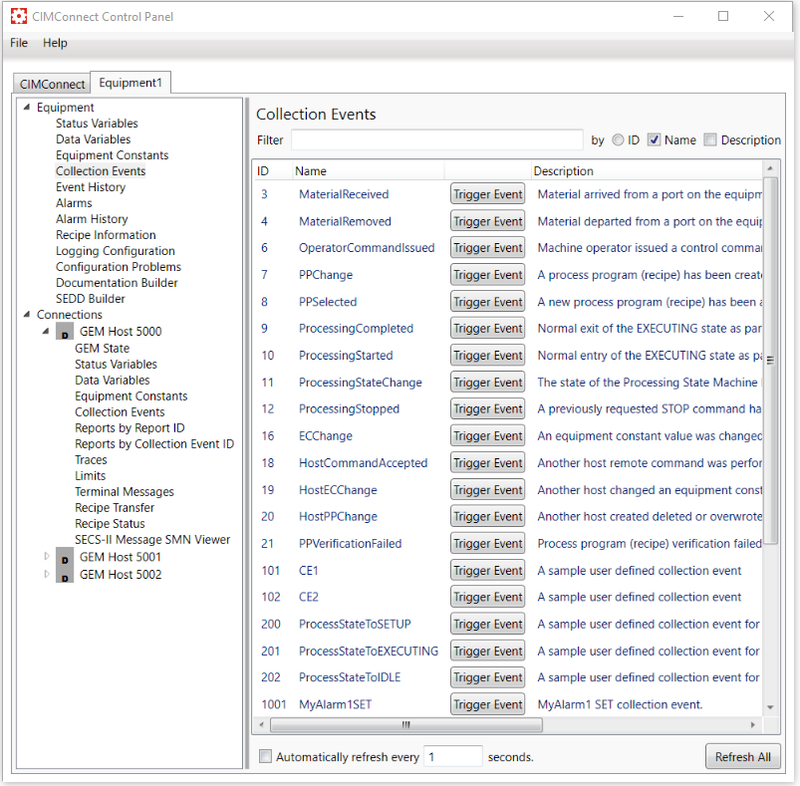 For users who need to create client-side data collection applications, Cimetrix also provides EDAConnect - a powerful library that handles all the connection details and allows developers to concentrate on the specific data collection and analysis tasks. Fabs receive a wide variety of equipment with EDA implementations from numerous vendors. They want to use a single verification application to make sure that all EDA implementations are compliant to the EDA standards. That’s where EDATester comes in. EDATester is a new product that allows users to quickly and accurately verify EDA standards compliance by automating the test procedures ISMI EDA Evaluation Method that were defined specifically for this purpose. If you use Cimetrix products to implement your EDA interface, you are guaranteed to be compliant with the SEMI EDA standards. But whether you use Cimetrix products to implement your EDA interface or not, you (and your fab customer) want to rest assured that your implementation is fully compliant. Moreover, you’ll want to know that you’ve met the fab’s performance criteria for your equipment interface. 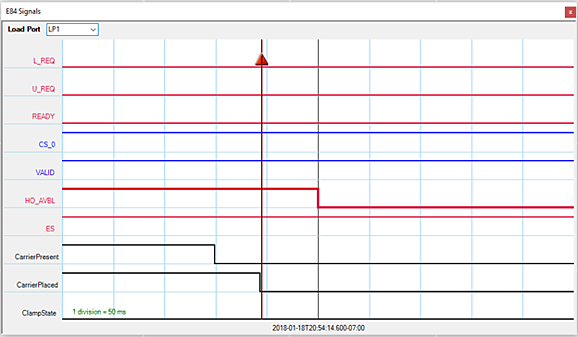 To support this use case, the EDATester also allows users to quickly profile the performance of EDA data collection on a piece of equipment so that fabs and those using the data will know the boundaries within which they can successfully collect equipment data. With the well-stocked EDA tool box provided by Cimetrix, following the EDA best practices in creating an efficient, standards-compliant EDA interface becomes a snap.